Trust Rappler to give air time to any content that works towards painting a beaten enemy of the Opposition’s favourite bogeyman — the Philippine military — as victims of yet another “human rights” travesity. In the “report” Overkill? 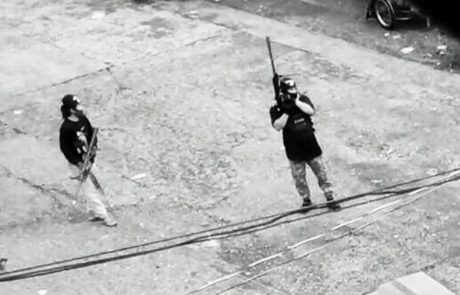 Some locals question Marawi shelling (seemingly re-published from Al Jazeera), the devastation wreaked upon Marawi City is used as a context to ponder, in hindsight, possible missed opportunities had a “different strategy” been applied to liberating it of entrenched pro-ISIS fighters. “Surrender”? Suddenly the word is part of Islamic extremists’ vocabulary. Or, rather, people with nothing more than the easy brilliance offered by essentially useless hindsight put that word in terrorists’ mouths. These, of course, are terrorists — people who believe in the glory of blowing themselves up in the middle of a bustling nightclub or running over innocent tourists enjoying the sites on an ancient European avenue. Their foresight in the heat of battle hardly ever offers that option — only, perhaps, in hindsight and, even more likely, in the hindsight of those who would go on to defend their sudden entitlement to “human rights” after the fact of their defeat. During a brief ceasefire on the Muslim feast of Eid al-Fitr, Sharief and 7 other ulama entered the war zone to speak with Abdullah Maute, a leader of the fighters, to negotiate for hostages. Quite rich, actually. Conditional surrender. This is a request coming from the sorts of people who take and broadcast videos of captured soldiers being decapitated with a small blunt knife or burned alive inside a cage. Even more astounding is the nature of the condition — that the surrender be mediated by another terrorist group. It would be funny if it weren’t for the fact that this is about a hideous enemy that does not wage war according to the rules of civilised societies, does not see its own enemies as equally human, nor even considered the consequences to the citizens of a city they intended to turn into a vast weapons depot and a launch pad for the violent rise of a “caliphate” the streets of which will, presumably, be paved with the skulls of Christian infidels. It seems the author of this Rappler report is just short of suggesting that the reduction of Marawi City to a pile of rubble is on the Philippine military, never mind that this all could have been prevented had the enemy been a bit more considerate — no, a bit more human — in the way they thought things through and in the way they fought their war. Filipinos should be resolute in the winning of the War for Marawi City — one of the very few won against a foreign invader in their history. They should celebrate the victory of their valiant soldiers and uphold a narrative of an enemy’s plan to deprive a nation of its humanity thwarted decisively. In short, Filipinos should hold their heads high and think and act like winners rather than succumb to the emotional blackmail of cliques within their society who hoped for a different outcome — one that would have validated their insidious political agendas. The Armed Forces were not trained in urban warfare, inadequately equipped, and there was more focus on a military buildup for a Naval confrontation with China than the terrorists and rebels in our backyard, so yes, blame it all on current administration and the military instead of the lack of hindsight of Noynoy and his allies who were more focused on getting into the good graces of Obama by allowing the Philippines be it’s proxy against China. But Rappler being the little thugs they are quoting and reposting Al-Jazeera which is a Qatari owned propaganda network which is known to defend terrorism and downplay Islamic radicalism and their own domestic affairs is quite rich. “Conditional Surrender” they must mean the jihadist tactics of “Taqiyya” which is to deceive the infidels and plan for their demise, no mention of this tactic being used in Egypt, Iraq, Afghanistan, Syria, and Libya against the security forces there whose officers are promptly blown up by a suicide bomber or a car bomb. Let’s also ignore the fact that if the Government even shows any points of weakness by dealing and allowing these terrorists to get away with everything, we might as well put up a Islamic State sign in Mindanao for the whole world to see. So all-in-all, Rappler and Al-Jazeera working together with a ludicrous idea that terrorists did nothing wrong and we infidels and unbelievers should feel bad for them and we should continue to appease all of their insane demands. We don’t want this to happen in our country. There is no “Human Rights”, in the vocabulary of Islamic Terrorists. Martyrdom is all they wanted. So, we send them to their ” Paradise”, to have those 72 virgins ! That claim of Maute wanting surrender sounds like what Paul Farol had described before as nagsalsal ng storya. Heck, these guys want to kill people and take over a place, and you’d want to negotiate with them? That guy’s brain is really not mounted right. Must be another “armchair strategist…” or just someone stuck to their armchair. Its as simple as this: somebody forces his way into your home with the intent to steal, kill and destroy…. you don’t effing negotiate with him, you blow his head off to let him meet his maker. Some logic this rappler idiot author has, what a moron. Should have done this… Should have done that… Look at what happened to the case of Rolando Mendoza (Luneta bus hostage taker, our first glimpse of PNoy incompetence at its glimmering best). Bleeding hearts were hoping to spare the hostage takers life by convincing him to surrender. Then there’s the Master of Unsolicited Advice playing her flute again… “Marawi officials wary of Robredo’s pitch to preserve ruins (CNN)”. If these people are as smart as they project themselves to be, why aren’t they running the show? To all Yellow farts: You did it YOUR way, and you FAILED miserably! Filipino people who are hungry for success already know what to do when you open your mouth to offer advice: listen to it carefully; then do the exact OPPOSITE (call it the reverse-Yellow formula for success). Today the guns in Marawi City are silent. A great tragedy has ended. A great victory has been won. The skies no longer rain with death — men everywhere walk upright in the sunlight. The mission has been completed. A new era is upon us. Even the lesson of victory itself brings with it profound concern, both for our future security and the survival of the country. Men since the beginning of time have sought peace. Today, freedom is on the offensive, democracy is on the march. Today, unshackled people of Marawi City are tasting the full sweetness of liberty, the relief from fear. There’s more to the seemingly random killing and destruction. On another level, the IS terrorism is designed to destroy infrastucture and devastate societies. What’s even more sinister about it is that in the process of destroying the terrorists, they’re also getting us to destroy our own- buildings and all. Resources are drained, lives are lost, and we’re side-tracked from doing what needs to be done. And if indeed Rappler is funded by non-local destabilizers, then they should be held responsible for more than the malicious propaganda. The enemy could use the time in a variety of ways, so it’s not advantageous to let up in any way. The enemy could use the time, so don’t let up.